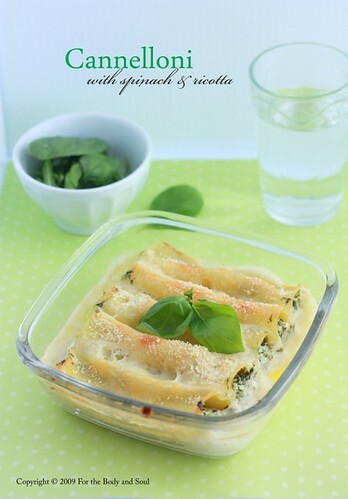 The spinach and ricotta cannelloni is one of the dishes I serve most often at my place. I’ve been making the cannelloni for years now and we've never really got bored with it. In fact, both me and my husband like them so much, that we cook them almost every week. It’s a truly delicious meal, and, once you’ve mastered the recipe it’s really quick to prepare. It also reheats well, so you can prepare it in advance. Some people (my sister for example), prefer to eat their cannelloni only the next day as with time the pasta develops more flavours. I like my cannelloni most with white wine sauce, but I know some people prefer tomato sauce. If you too decide to use tomato sauce instead of the wine sauce, add some water to it, as the pasta absorbs a lot of liquid while baking. 1. In a large pan heat the olive oil, add the garlic and cook for a few seconds. Add the spinach and cook for 2-3 minutes (if the spinach is not completely thawed this will take longer). Leave to cool slightly. 3. Preheat the oven to 180°C (350°F). In meantime prepare the sauce. Melt the butter and flour in a saucepan over low heat, stirring constantly until you have smooth paste. Add a little wine alternating with a little milk, stirring well after each addition. Continue until all the wine and milk has been used and the sauce starts to thicken. Stir constantly. Season with salt and white pepper. 4. Pour half of the sauce into a large baking dish, arrange the cannelloni in a single layer over the sauce, cover with the rest of the sauce, sprinkle with the remaining Romano or parmesan. cheese. Bake for about 40 minutes or until tender. MMMMMM...I just love those 2 combinations, I agree, it is lovely!! !